Successfully Added Auto Sentinel - Vehicle Security System (GPS Tracker + SMS Remote Presence) to your Shopping Cart. If A1 top notch security for your car is what you're after, then the Auto Sentinel car protection system is for you. The Auto Sentinel is state of art car security featuring advanced GPS tracking using the famous Sirf Star III GPS chipset and a quadband GSM/GPRS command center which both receives SMS commands and sends out SMS alerts! Ideal when your vehicle security has been compromised. The Auto Sentinel - The ultimate safety device for your own automobile as well as the perfect solution for commercial car, van, or truck fleet operations! Track Like A Pro! : At the heart of this incredible car security device is the famous Sirf Star III GPS chipset. Sirf Star is the GPS CPU of choice for all high end stock and customized vehicle security solutions because of its reliability and versatility. With improved satellite signaling through enhanced extra channel connectivity, your vehicle is VIP safe no matter how tough the streets are or how rough the road gets! On demand reporting of latitude, longitude, velocity, and geo-fence alarm when the installed vehicle enters or exits from a preset perimeter are just some of the advanced GPS tracking features you have access to. GSM/GPRS Command Receiver Center: The Auto Sentinel utilizes a mainframe box with SIM card slot. The slot accepts any quadband GSM SIM card - translation, this car protection system can be used anywhere in the world. The mainframe and SIM card functionality allows you to send text message commands to the number associated with the main frame SIM card. Examples of commands include: Cut gas and battery power to immobilize engine (when the car slows to 30 km/h), monitoring car cabin through included speaker, and two way voice communication through included speaker and MIC. GSM/GPRS Command Signal Center: The Auto Sentinel mainframe and SIM card functionality allows you to receive alerts when the car has been parked at a location over a certain time limit (great for avoiding parking tickets), when the car moves over a certain speed, when the car goes from a parked position to a moving position, when the SOS button has been pressed, when the car experiences vibration inducing contact, when the engine is illegally started, or when a door is opened unexpectedly. Aside from being technologically advanced, the Auto Sentinel also plays nice. It is compatible with your existing remote control so you can ARM and DISARM using your existing equipment. 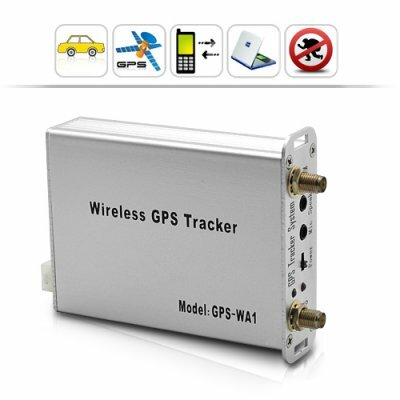 Furthermore, the Auto Sentinel supports GPS monitoring software and web tracking. So click "add to cart" today and tomorrow your order will be on its way. Brought to you by the online security specialists - Chinavasion.